LOW Monthly rates! Brand New 3 Bed/2 Bath. Walk to Kenai river! Close to Bings! This property has INSTANT booking. If the dates are available on the calendar, then you can go ahead & book! Newly constructed Alaskan Dream Home. Just 1/4 mile from the World Famous Kenai River. 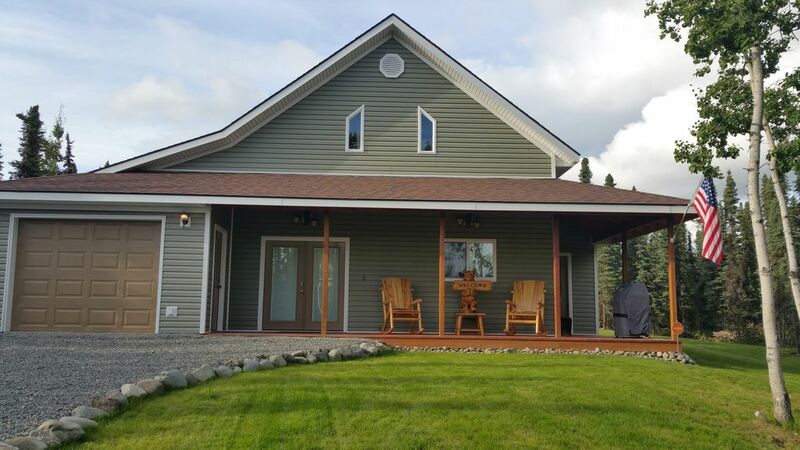 Located in Sterling on the Kenai pennensula. You will drive up to a Beautifully landscaped yard with a Big Front porch. *Kitchen Aid Grill under the covered gazebo so you can grill rain or shine. *Professionally decorated with Alaska inspired Decor. The furnishing's and art are new, clean and beautiful! Top Quality Mattresses in all rooms. Beautiful fully-equipped kitchen with all stainless steel appliances. *Electric Fireplace with heat & in floor heat for entire house. *Direct Satellite TV including all news channels. The Satellite TV service is in the living room and in BOTH bedrooms with King beds. Shopping, Restaurants, Fred Myers, Walmart, Nature museums, Sportsmans Warehouse. This home is located off Sterling Hwy, to Scout Lake (Paved) to Fields Rd. (Gravel). ALL Cell phones &Tablets work PERFECTLY here! ***THERE IS NO WI-FI IN THE HOME!!! So that means No Netflix unless you use your own hotspot. Sterling does not have access to Wi-Fi in this location. We are 1st in line when it becomes available! Your Mobile HOT SPOT is GREAT here. We have tested Verizon, T-Mobile, and AT&T and it has been EXCELLENT. ***ABSOLUTELY NO SMOKING INSIDE THE HOME. Brand new full size Guest to provide detergent. This home is perfect for families. There were 6 of us and we were all very comfortable. Floor heat kept the temperature consistent and comfy. Kitchen is set up perfectly for cooking meals and the grill outside gives you options for preparing indoor or outdoor fare. The fire pit in back makes evening fireside family time great fun. Absolutely perfect! This was a perfect place for us to relax. We loved it. Wonderful, comfortable home in a peaceful neighborhood. Jeff is a gracious host and has maintained his home meticulously. We will be back! My friends rented this home- They loved the home and said that Jeff was very accommodating! They said it was a “beautiful home and they would love to stay again!”! “Plenty of room and very clean!”! A beautiful home in peaceful surroundings. We found the home to be clean and well equipped with all the necessary amenities. Hope to make it back this way again soon.